Traditional pedagogical practices are rooted in the era of the Industrial Revolution, when schools for the public became common but the general population, and their children, were still thought to be stupid and vacant, and their teachers the fount of knowledge. Much of the general populace still grew up and was being reared to serve the elite, and therefore, there was no need for teachers and students to strive for anything other than surface learning – a mere memorization of facts, choosing of the correct answers, filling in of blanks. The twenty-first century however demands students to be able to think critically, creatively, and communicate and collaborate with others to create new knowledge systems. Communicative language teaching (CLT) in ESL fits the bill. If you teach communicatively, you are already preparing your students for 21st century’s unique challenges. But is there anything more? Anything to deepen the learning? Despite our post-CELTA and post-DELTA teaching expertise, too many students slip through the net, into the abyss of language learning despair. Is there a way to take CLT to a new level and make deep learning the norm? As an aside, watch this fantastic video on the futility of the modern day education system. If you didn’t read Sheila’s story, go ahead and read it here. Sheila needed not just a great manager, but an inclusive manager. She had already received complaints from parents and her teaching assistants, and there appeared to be some disgruntled noise from other teachers as well. Sheila was a new hire in a new country and at risk of being alienated at her workplace. So what could her manager do? to ensure Sheila settled in well into the new country, new school, with her new colleagues. In my previous posts, we read about what inclusive leadership means, what inclusivity is, and what it means in the context of educators and academic leaders. Today, I want to think more broadly about action steps one can take to become an inclusive leader. But first, what are the traits of great leadership? I brainstormed with my friends and colleagues to think about all the traits we associate with great leadership, and came up with all of these: honesty, decisiveness, genuinity, restlessness, passion, communication skills, innovative thinking, generous, open-mindedness, steadiness, focused, insightful, confidence, positivity, empowered & empowering, organized and persistent. Think about your current / past boss. Would you call them a great leader? Think about a leader in your organization. Is he or she a good boss too? 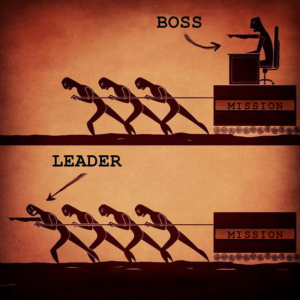 The picture here effectively summarizes the differences between a boss and a leader. The term ‘boss’ usually has negative connotations – one can usually visualize an authority figure, one who’s also usually authoritarian. A boss is someone who directs, demands, drives (one up the wall). The word ‘leader’, on the other hand, has predominantly positive connotations. A leader is a coach, a mentor, an inspiration. I think one of the most significant differences between a boss and a leader is that the latter is someone we would like to follow, to emulate, to become. I took this course on Inclusive Leadership on edX earlier this year and had so many thoughts about how to apply the learnings as a teacher and teacher trainer. But first, I want to tell you a story. A teacher was once summoned by her manager. A summon is in itself fairly ominous but the manager started the discussion with a forced smile and casual chit-chat which convinced the teacher she was in trouble for ‘something’. She tried to stay calm and smile but in her head, she was feverishly running through the events of the last week, trying to figure out what she might have done, where she may have slipped, which student may have complained. Some are born great teachers, some achieve greatness, and some have greatness thrust upon them. I think the watershed moment in any teachers’ career is when they stop thinking about the quality of their teaching and assess lessons based on the quality of their students’ learning. All those utterly boring lesson aims (should) have one goal: students should come out the other end having learned something.